There's some great stuff posted in this thread, I look forward to sitting down and giving it a good read. Thanks Mr. Small. By the way Geoffrey I forgot to say that I really do like the image on the invitation. Is it the actual invitation or just some kind of announcement? Or did he send you one? I was wondering the same thing. It seems very private and exclusive, and yet it's posted here so..
Mr. Small, is this just an announcement letting us know you'll be showing in Paris? Or are folks in this forum invited to come view your collection? I'm assuming the former as it states that it's by appointment only. Could someone please set matters straight? I think that Geoffrey was just posting the invite for your information and to keep you informed as to how the industry works. Unfortunately, it is not possible to open the showroom to the general public (even SZers). Designers, press and buyers all have to be very protective of their work and therefore the showroom is a very protected place. Having said that, the SZers will be represented at many of the showrooms, including Geoffrey's, by Faust, Lowery, Fuuma, DHC, and of course the old hobo, so fear not, I'm sure that you'll get regular updates. Incidentally, I was thinking of starting a photo blog for you guys to get a little behind the scenes action. If anyone is interested, let me know. M, would be interested to see this. Will need some text for context. Great if you have the time. in the world's most competitive designer arena. we have ever dealt with. and his or her new collection." as a more latent sort. Keep your head above it. It has to look good. The madness of the whole thing. Last edited by Geoffrey B. Small; 01-06-2011 at 10:58 AM. Find the groove and you find the freedom. the first will "fire up"
and lead in the Barbie's? in your car on the freeway right now. Last edited by Geoffrey B. Small; 01-06-2011 at 11:00 AM. 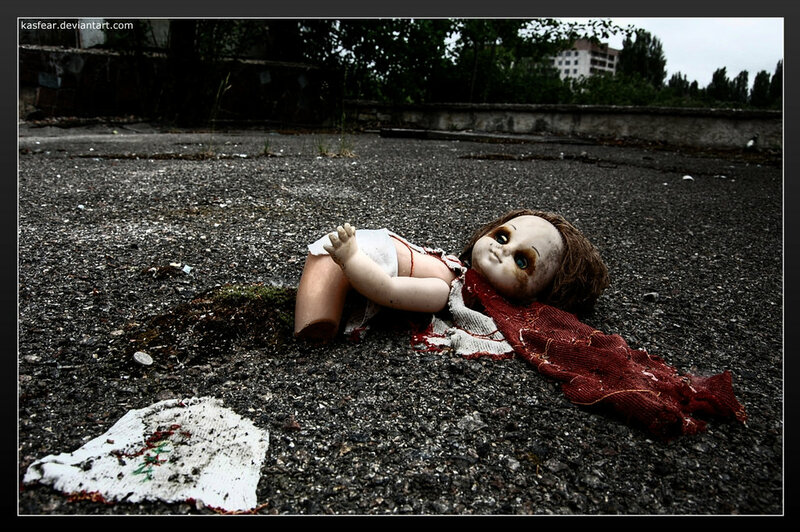 A little girl's doll photographed still laying on a field in the city of Pripyat, 23 years after the explosion of Chernobyl, where 45,000 men, women and children were evacuated suddenly in buses after being told they would need to leave their homes temporarily for a few days on April 29, 1986 as a burning cloud of deadly levels of radioactive nuclear waste rained down over thousands of kilometres of territory around them. No one has ever returned to live there. The abandoned city today is a testament to the safety and real risks of nuclear energy, if you remain more than several hours in the city and anywhere within a vast distance in its countryside, you will still receive a lethal dose of radiation that will kill you within weeks. Yet so few have been informed. And now it is being rammed through as a clean energy solution to global warming. Right. Do we really need 740 of these by 2020? I am undecided on nuclear power, I see the necessity in our current situation in regards to resources and global warming however the detrimental effects of waste and high risk are quite overwelming.My very simple conclusion on it is that for now it is so depended upon that it seems hard to stop it, however it is clear that it is only a temporary solution. 1) The quality of the materials, from finest overdyed cashmeres to washed Italian silks for the linings, and construction quality. 2) His honest and gentle character. Very happy to have you here and a personal thanks from me. I want to thank you for the coat I am wearing. It's the black wool overcoat from Sartorialoft. It has been my armor this winter in Illinois. I had the pleasure of meeting Geoffrey and inspecting his work for the first time in person. I was deeply moved. I have not been so touched by the tactile experience of a garment since the very first time I experienced Yohji Yamamoto. Geoffrey is clearly a passionate, hard-working individual and this shines through his work. Geoffrey, thank you for showing me that there is hope somewhere in the 'system' of fashion. thanks very much for your post and video from Cambridge Ideas, I have given the video a very thorough review, and I just don't buy their numbers. Fundamentally, they do not address consumption behaviour and conservation nearly enough for me-- beginning with their use of 40 watt lightbulbs for their demonstration. There is absolutely no reason for anyone to be using that kind of lightbulb anymore for anything, and the very fact that they did so without any mention of the new low consumption bulbs immediately makes me think they are working for, or funded by, the energy industry interests. I changed all of our lightbulbs to low wattage fluorescents in all our residential and work spaces here in Italy in 2008 and in one month saw my electric bills go down by more than half. Just by changing the lightbulbs. Old 100watt lightbulbs can now be cheaply replaced by new ones that use 11 watts for equivalent light. That's almost a 10-fold reduction in energy consumption and need. The nuclear and electrical grid energy industries want you to believe that you really need them and you need more and more power so you must accept a temporary solution now like nuclear. But nuclear is not a temporary solution in any sense of the word. Once you startup a nuclear reactor it takes forever to shut it down and even longer to get rid of it, including the waste which starting with plutonium has a half life of 250,000 years. Given all the costs and perils nuclear presents to me, my family and the next 6000 generations of my race, frankly, I don't think I need all that electricity, thanks. In fact, if you really look into it--these companies plan to sell most of the electricity on the new unregulated energy markets to other utilities in other countries much more than furnish you with the electricity you actually need. In any case, if I had to choose between Leukemia and even life by candlelight at night for the rest of my life, you know what, I 'd go for the candles in a second (ever talk to someone dying of leukemia? pretty nasty way to go--especially if you are a kid--the most likely to get it if you live near a nuclear powerstation). Or better yet, how do you feel about this one? yeah...world nuclear party. everyone's invited. Rock on. by 20 percent of the world's population. Our totally rampant and unchecked consumption at all levels is at the core of the world's problems. We don't need more energy at our disposal, we need to waste less, conserve more, and actually begin to live much better for ourselves, and among our brethren, as a result. Fashion is the same and mirrors the situation. But nuclear is far more dangerous for all of us. There is simply no margin for error. Please think it over Huckleberry, before it's too late.